I'm not someone who minds getting old, so reaching 40 was quite an event for me. So, even though my 40th birthday was three years ago, I'd like to use my 40th episode as an excuse to celebrate it all over again, with you. Enjoy! Pilar. 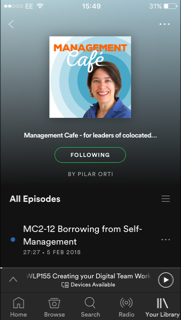 In this episode Pilar draws on one of her current voiceover jobs to extract some very valuable leadership lessons, when working with a "cabin crew" style team. She talks about what she has observed in the recording studio while working on a new animation series. During the second part of this episode, Pilar gets a bit more personal and shares why she's sticking to Virtual not Distant. Maybe one day we'll be able to apply the "not Distant" to all teams, virtual or not.